Description: Dont forget your tablet! Youll look smart and focused with the Innovator Compendium. 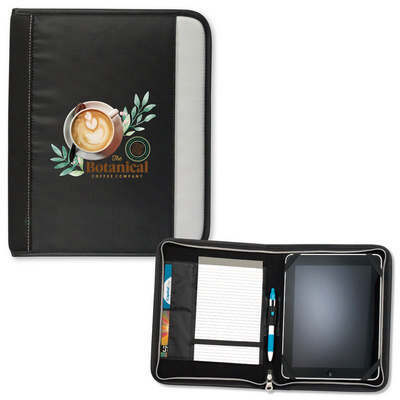 Includes 5" x 8" writing pad with elastic restraint | Neoprene / tech diamond weave | Adjustable, removable Velcro corners | Pen loop | Card pockets | Fits most tablets and e-readers | Front slip pocket. Size: 24cm w x 29cm h x 3cm d. Colours: Black,Black | Black,Royal. Decoration Areas: Supacolour | Screen Print.